My name is Martin Wood. I was diagnosed with Type 1 (insulin-dependent) diabetes on May 11, 1981 at age two. 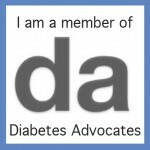 I am a diabetes blogger, advocate, and all-purpose funny guy with a good-for-nothing pancreas and an affinity for all things plaid. Here you’ll find me sharing about my life with diabetes, and how I deal with it and life’s moments on a daily basis in mostly positive, often humorous, and sometimes emotional ways. This is not a blog for medical advice. If you have questions about your health and diabetes, you should consult with your doctor and healthcare team. I have a MiniMed Revel insulin pump, with Continuous Glucose Monitoring, that I affectionately call Gort.